Steph and Golden State can break the 20-year-old regular season record in their final game on Wednesday night. History boys: Curry and Green celebrate. 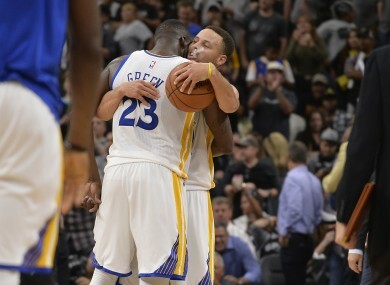 THE GOLDEN STATE Warriors notched their record-equalling 72nd victory of the NBA season last night, beating the Spurs in San Antonio 92-86 in a Western Conference heavyweight clash. The reigning NBA champion Warriors improved to 72-9, matching the league record for regular-season wins set by the 72-10 Chicago Bulls led by Michael Jordan in 1995-96. The Warriors can break the record with a victory on Wednesday, when they conclude the regular-season against the Memphis Grizzlies at home in Oakland. “We’ve got a great group of guys, that really sacrifice every single night,” Warriors star Stephen Curry, who scored 37 points, said of what it took to reach the milestone. The Warriors’ hopes of matching or exceeding the Bulls’ mark had dwindled with losses to the Minnesota Timberwolves and Boston Celtics this month. Golden State eked out a 100-99 victory over the Grizzlies in Memphis on Saturday, but the clash with the Spurs, who were a perfect 39-0 at home this season going into the contest, was seen as a major hurdle. Warriors coach Steve Kerr called it one of the team’s best wins of the season, as his players coped with the second night of a back-to-back in hostile territory. With that said, Kerr noted that the victory “means nothing come playoff time”. Email “One win from history! Warriors beat the Spurs to match the Bulls' record”. Feedback on “One win from history! Warriors beat the Spurs to match the Bulls' record”.